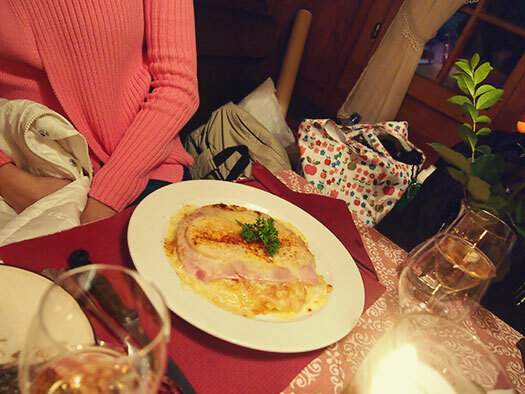 We came back to Interlaken for dinner as we couldn’t find anything decent in Wengen, the restaurants there were mainly co-owned by the hotels, so the prices are slightly expensive for us, although we did have a few good recommendations. Another reason for coming back to Interlaken was because our hotel recommended a restaurant for good fondue. 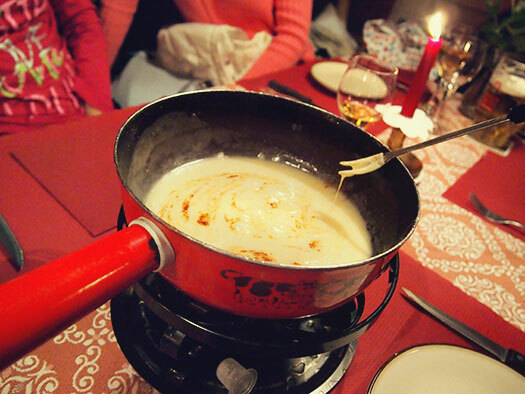 Need to apologize that I mentioned raclette in the previous post, my mistake, it was fondue that I was talking about. We missed a chance to grab fondue back in Geneva, so this will be our first try at this traditional Swiss dish, usually eaten during winter. But since it was raining and it felt cold, we thought the weather would be better enjoyed if we had a warm meal. We didn’t have reservations and we were quite lucky, they had an empty table for us. Look at the place, it was packed full of locals and some tourists. I still need to get used to getting reservations for dinner. Twice in Europe and I haven’t had it down yet. Just not the typical thing that I do back home. 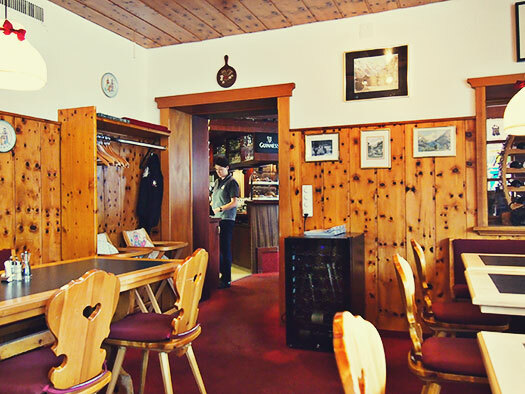 The restaurant is located in Unterseen and is quite some distance from the usual tourist areas. But with the Swiss Pass, we could just hop on any bus and be there in a few minutes. The wonders of the all-encompassing ticket. Tip: Despite what you’ve read so far, please make reservations for dinner if you intend on eating at the place that you want. I’m just lucky. “I read online that we needed some wine, so that the fondue doesn’t stick,” I said. 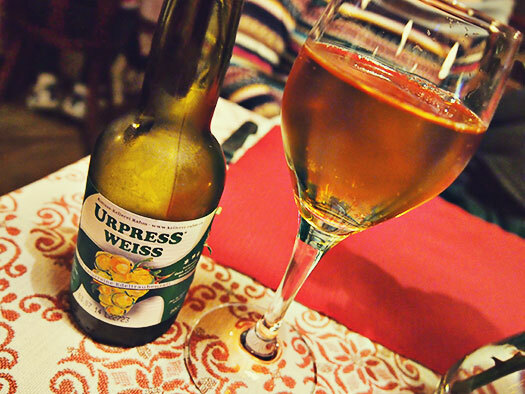 I think we ordered some non-alcoholic grape wine to go with the food. The fondue is really melted cheese in a pot, and we would dip bread into it to soak up the cheese. 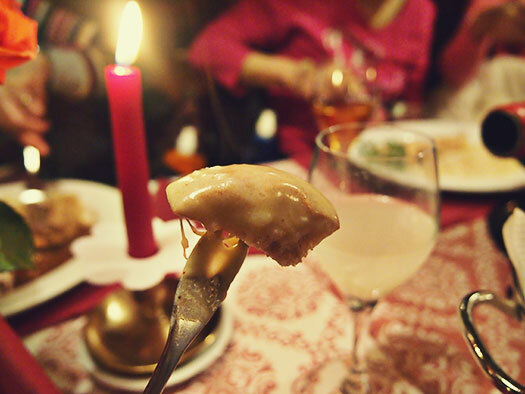 You need to be a cheese lover in order to enjoy fondue. And it’s best to just order enough for two. We were a group of six and we found it just nice, with regards to the rest of the dishes we ordered. Fondue is meant to be a side dish and they come in servings of two. I think the perfect equation would be to order two servings less than the number of people eating. 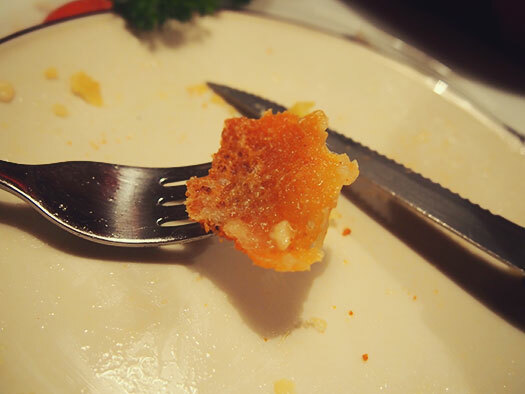 Tip: You need to eat till the end, and scrape the final piece at the bottom of the pot. Look at the cheese coated bread. Actually, fondue reminded me of a certain Chinese dish called steamboat. Except that with clear soup, it is replaced with cheese. The Swiss have the Chinese steamboat version too but it’s not a traditional dish. The last crust is especially tasty and in certain areas, they even share it with each other! It tastes like dried pork skin. We also had a couple of their other dishes including rice and noodles. 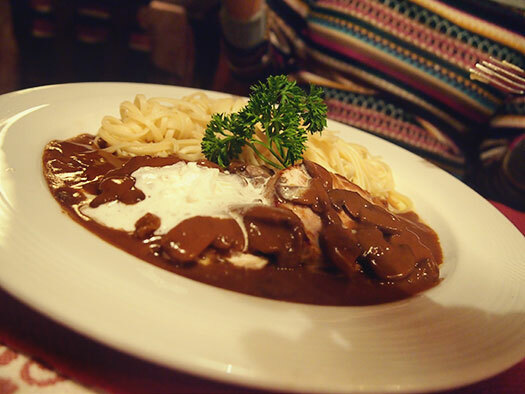 With chicken and veal. Veal seems to be part of their meal here. Most restaurants offer veal in various dishes. 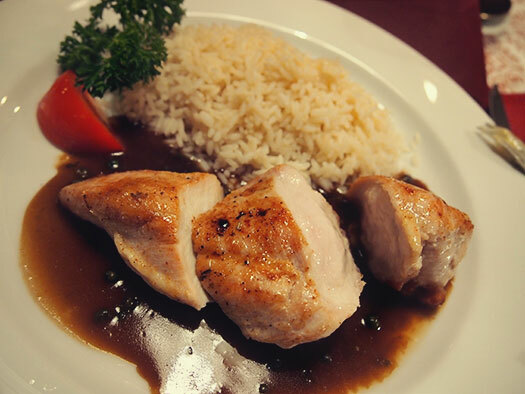 Swiss version of chicken rice? Since the restaurant is packed with locals and tourists alike, I feel that it’s a great place to have your dinner here. Just make sure you have your reservations. 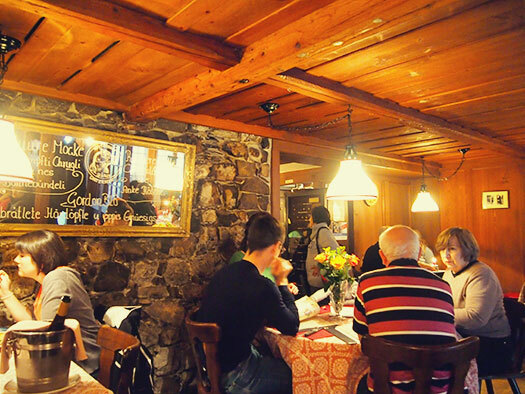 The ambiance is quite cosy and most of the tables are bunched up together, with only a certain amount of elbow space in between. But don’t worry, you will feel welcomed here and please do try their fondue. Even though there might be some other places in Switzerland that offers a much better version, but in Unterseen, this is one of the best. 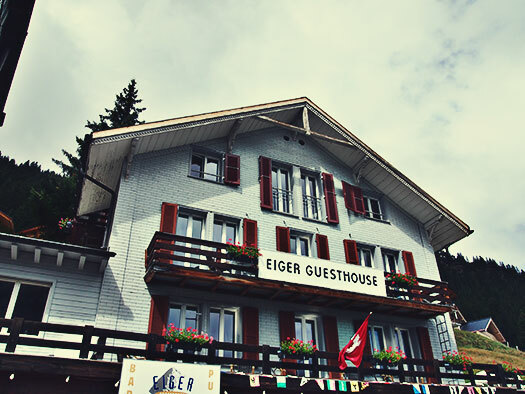 It was time for us to bade farewell to Mürren and Gimmelwald. Time to make our way back to lower ground. The Schiltornbahn arrived right on time and this time around, it was packed with fellow tourists, everyone is trying to make their way to Stechelberg. Tip: If you have the time, you can walk the 2.5km way back to Lauterbrunnen from Stechelberg. Taking in the surrounding areas and the numerous waterfalls. The Swiss made things really easy for us. 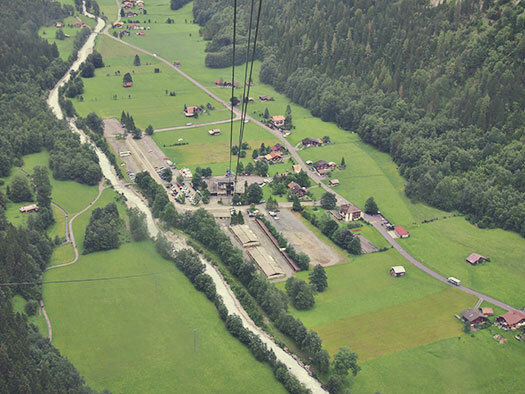 All we had to do was to hop onto the bus which was waiting for us when we stepped off the Schiltornbahn. Our next destination — Trümmelbachfälle. It was a downcast day and there was a light drizzle. Our excursion in the mountainous areas of Switzerland has been nothing but rain and mist and fog. “No wonder most travel guides suggest that we have a flexible schedule for the mountains,” I quipped. The thing about mountains is the cold weather and the hot food. After tasting the rösti from our hike into the Swiss mountains, we are now at another mountainous area. The first thing you see when you step off the train at Mürren, is to check out the view from the side of the train station which is located on the cliff face. Those without a fear of heights should just look down and admire the view. We were already hungry from our trek, so this was the perfect place to keep warm and to keep our stomachs full. 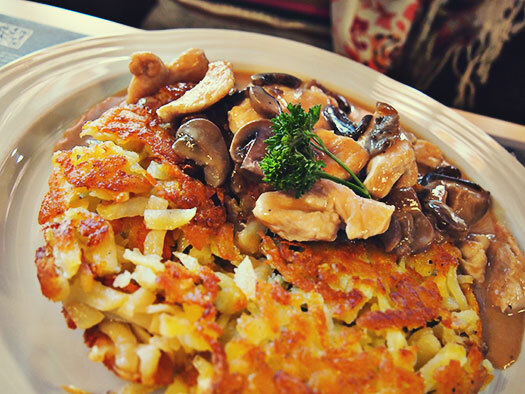 All that walking has really worked up our appetite and we are eager to give the rösti another try. You can even stay here if you prefer to have a place in the mountains. Imagine waking up to the views of the Jungfrau. That’s life, if you have the appetite for it. We were the only tourists at the Eiger during lunch hour. 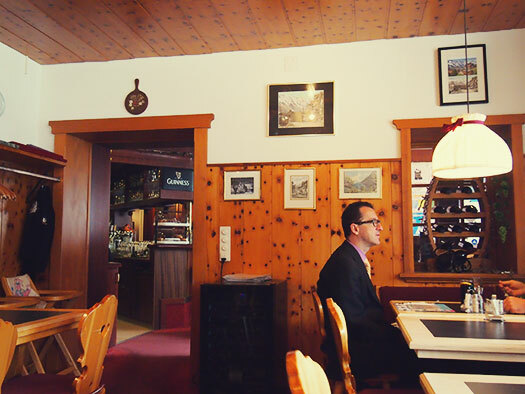 Kind of strange but in a small town like Mürren, there aren’t really that many customers. And furthermore, there are other establishment that serves other food. So just maybe, today wasn’t a day for rösti. But we weren’t going to be disappointed. 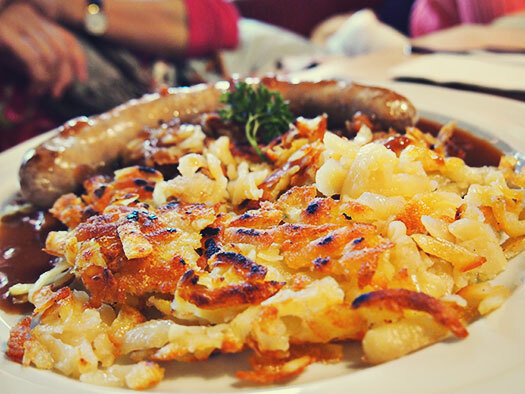 If you’re a fan of cheese and potatoes, rösti is the food for you. Not only is it filling, it’s appetizing. 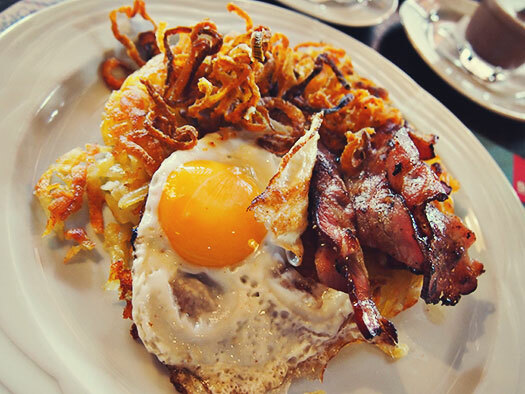 The rösti is cooked to a golden brownish colour and some crispy edges. Top it up with whatever that you prefer, bacon, veal, chicken, eggs. And presto, you have your dish right in front of you. 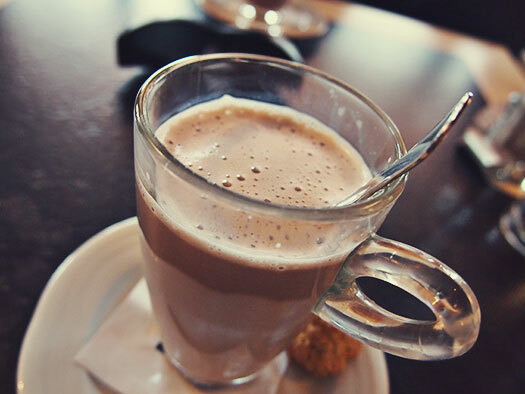 We are not used to the cold weather here in the mountainous regions, so with the heat generated from the food, we have the fuel to keep burning. So to speak.